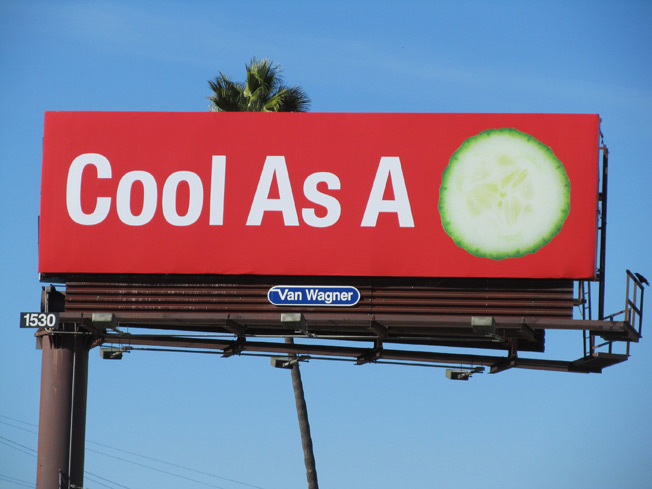 Van Wagner, the outdoor advertising company, has created billboards to advertise advertising on billboards. Catch that? It's kind of meta. When a billboard doesn't get sold, its owner can keep the old ad up, thus devaluing the space, leave the board blank or put a placeholder on it in the meantime. Van Wagner chose to go with the latter, but didn't want a simple black-on-white "Your Ad Here" sign. Instead, the company is now into its second round of posting its own curious ads on unsold billboards in New York and Los Angeles. The new ads, featuring bold colors, simple fonts and minimalist headlines (a mix of words and pictures), are fairly cryptic. They say things like, "An Apple a Day," "Cool as a Cucumber," "The Big Cheese" and "Easy as Pie." Prettier and more compelling than "Your Ad Here"? Yes. Confusing as well? Perhaps. The earlier round of ads was more straightforward, showing animals alongside single-word headlines ("Reach?" next to a giraffe, "Buzz?" next to a bee, etc.) that hinted at the power of outdoor advertising. (Those ads also included Van Wagner's logo and phone number.) The new ads are playful in a pop-art kind of way, but will they get someone to pick up the phone and beg Van Wagner for ad space? Time will tell. At the very least, they've succeeded in making me kind of hungry. More images below. Via City Room at The New York Times, which has lots more about the campaign and an interview with the creative director.